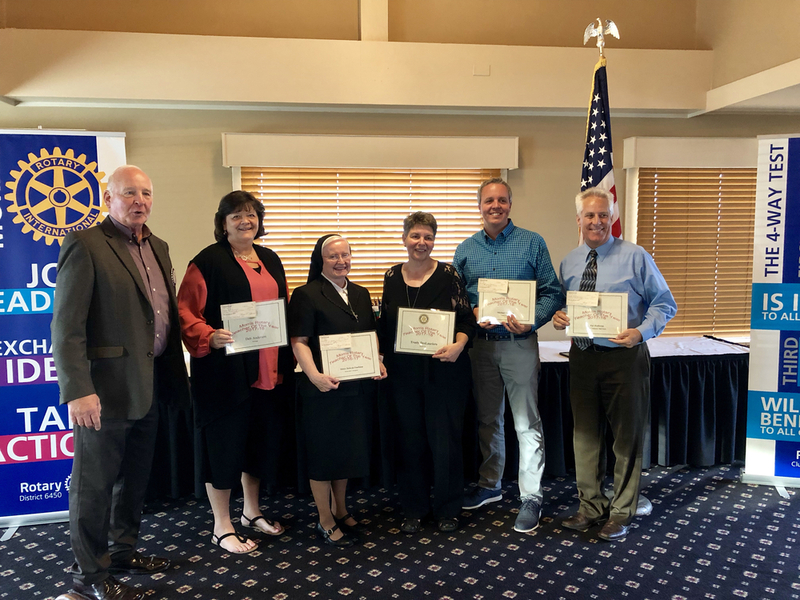 The Morris Rotary Club recognized local school teachers as Teacher of the Year on Tuesday, May 8, 2018. One of our beloved and dedicated teachers, Mrs. Trudy DesLauriers, was among the teachers chosen for this special award. The club recognizes local teachers annually for their dedication to children. A lifelong resident of Morris and the daughter of a Morris school teacher as well, Mrs. DesLauriers began her career at Morris Elementary School District #54 in 1991, teaching 8th grade reading and language arts at Shabbona School. She went on to teach in grades 4th through 8th over the years, also teaching students at Center School. Mrs. D. taught 5th grade students for many years when White Oak Elementary opened its doors in 2001, and most recently providing support to students as an Interventionist. Mrs. DesLauriers is known to students as having a compassionate, fun, and “hands on” approach to teaching and learning. “Be Verbs” are more fun to learn when students are singing them to a song! She is also known to bring history to life, such as having historical figures themselves visit her classroom to talk to students about their lives, or having a “Morris Field Trip” to visit Chief Shabbona. No one can forget her famous attraction, “The Museum of Science and Poultry”, or the chicks that were hatched every year in her room. In 2016, Mrs. DesLauriers introduced us to Martha, her sweet and lovable golden retriever and therapy dog, who visits friends at our school on Mondays. From working with a student who is learning to read, to visiting seniors at Park Point, Mrs. D. and Martha work together as a team to improve the lives of others. Mrs. DesLauriers resides in Morris with her husband, Kim, and their three golden retrievers. Congratulations to Mrs. DesLauriers on this very deserving award!